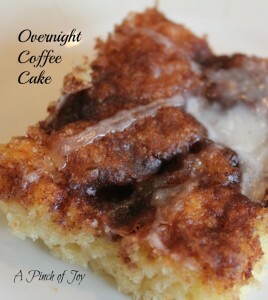 Sister Kay introduced the family to Overnight Coffee Cake at a family reunion two or three years ago. Crusty cinnamon sugar atop a light sweet dough – sooo good. She shared the recipe which is still in my to do file. This weekend we were at sister Vee’s home and were awakened with the wonderful aroma of baking bread and cinnamon. Vee graciously allowed me to take a picture of the coffee cake to share with you. Well, actually I said good morning, saw the pan setting on the table, grabbed a plate from the cupboard, my camera from the bedroom and went out to the front porch to take a picture. Wheels and Bytes are used to having perfectly good food snatched right out from in front of them for a photo session. Apparently that’s not the norm in every family! But they just laughed at me and gave me a place at the table anyway. Spicy cinnamon sugar atop a light, fluffly sweet dough -- cinnamon rolls without the "roll" and fuss. Proof yeast by adding package of yeast to the warm water (NOT hot) and letting set ten minutes. Combine dry ingredients, then cut in shortening.! Add eggs, milk and yeast mixture to dry ingredients and mix thoroughly. Dough will be very thick. Cover tightly and place in refrigerator to rise overnight. In the morning, grease 9x15" pan (jelly roll pan) and spread dough evenly over pan. Melt butter and drizzle over dough. Mix brown sugar and cinnamon, then sprinkle evenly over butter topped dough. If more sugar is desired, add ¼ cup brown sugar. Cover and let set at room temperature for twenty minutes. Add powdered sugar glaze, if desired. I made this up last night to bring to work. Three people have already asked me for the recipe in 15 minutes. We have a hit! Have a great weekend. You might even like variations– I bake it in large sheet cake pans with raisins scattered and slightly poked into dough just after spreading dough into pan & before the topping on a section, scatter coconut with topping on another section, add nuts under and in topping for another section. One pan lots of choices and some even enjoy the edges on sections where items combine.